With its world-class acceleration, handling, and design, the Roadster ranks amongst the world’s most coveted sports cars. Its engineering has no equal. Visit Tesla Motors official website to learn all about it. I can tell you this, when you sit inside such an exotic car you feel like you are in a movie. To see this masterpiece and to sit in it gives you goosebumps. You just can’t find a Tesla anywhere, it’s like finding a diamond in the pile of broken glass. I must be the luckiest girl in the world to be able visit Tesla Motors in Los Angeles, California and receive such friendly service. This electric vehicle is first in its class, facing concerns for the environment, standing for what is right. I have so much respect for engineers who put their heart and soul into it and created beauty for this world, it’s unforgettable magical experience. The hand-built, carbon fiber Roadster sets the mark for premium electric cars to come. The monocoque chassis, constructed of resin-bonded and riveted extruded aluminum adds rigidity and strength to the lightweight package. Recently world has welcomed new Model S, family oriented electric perfection. 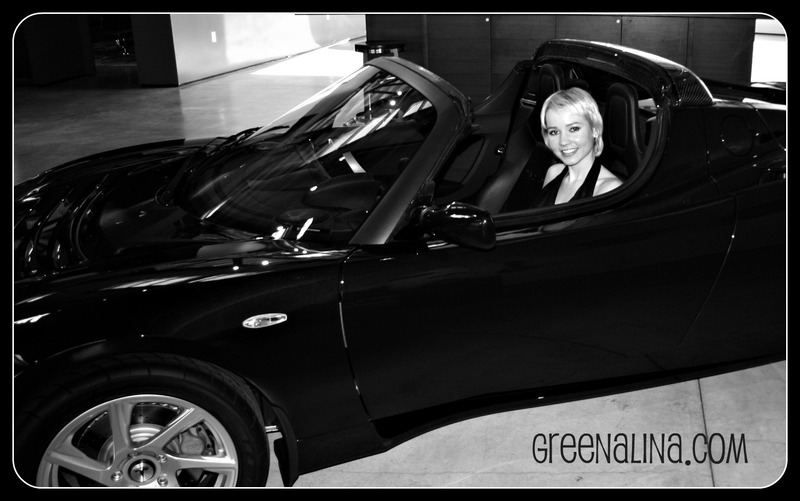 This entry was posted in alina wheetley, eco, electric car, Environment, future, going green, luxury car, plug-in, roadster, tesla, Uncategorized and tagged alina wheetley, car, eco, eco-friendly, electric car, environment, going green, luxury car, plug in, roadster, tesla. Bookmark the permalink.